GPU temperature (Ambient temp: 26°C) – Darker bar is the temperature in idle mode. 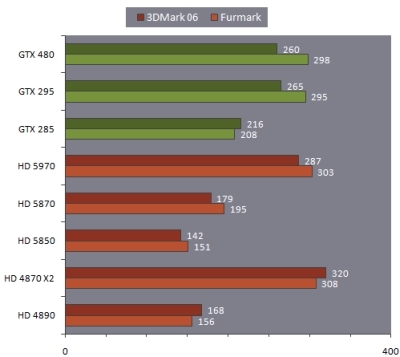 AnandTech, with a pair of GTX 480 in SLI, has measured 851W under FurMark for the total power consumption of the system (in idle, the total power consumption of the system is 260W). 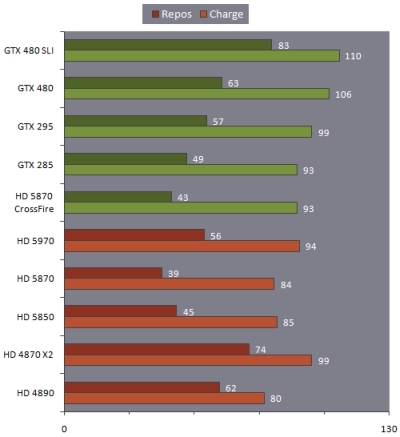 851 – 260 = 591W for the GTX 480 SLI. Then around 295W for a single GTX 480. This won’t have any significant impact on the card, but if you’re like us your eyes will pop out of your head at least once when you see a GTX 480 hitting 98C on FurMark. How can you cool down those kind of cards when they are on SLI and have no space between them ? I’d like to build a quad SLI system with maybe less powerful graphic cards.. but i wonder if a system like that can be cooled efficiently. Any articles about temperatures and air flow of quad SLI systems ? Now I really disappointed by Nvidia. Waiting almost 5 month just for this watt-eater and hard-rock-sound-maker card?? There’s one good thing about this card. Just another NV30 disaster, well executed NVidia. Wow, 3.2 Bilion of transistor can generate a lot of heat. From what I heard, the 5000 series has a hardware protection that does some checks regarding alu to texture operation or something and that protects the card from ultra high ALU operations, like in furmark. Still my two 5850s work pretty well in furmark, with good temperatures and crossfire support as well! “Max power consumption during a gaming session”? What the heck does that mean? That is so vague it makes the metric completely meaningless. I bet anything that draws more than 250W is automatically defined as a “non-typical gaming session”. So…coming from someone who’s stood next to their fair share of planes, when is this thing going airborne? From the sound of it compared to a 280/285, Triple SLI these and you won’t want a case on casters that weighs anything less than 50 pounds. Damn! I love the card! Performance Love it! But the sound! DAmn that is Freaking loud ppl! !